For many, social media is a deeply ingrained part of daily life. For companies it’s become an integral part of their marketing and communications strategy. Because of this, the security of these services is something users expect. 99% of the time. However, there are breaches that can cause trouble for users. It only took one month for the first major security breach of a social network, and this time it happened to Twitter. 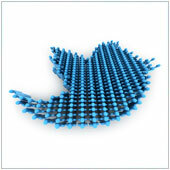 On the first of February, Twitter announced on their blog that slightly over 250,000 accounts had been compromised. Yes, the hackers did get access to passwords, although the company noted that they got the ‘encrypted/salted’ versions, this means they didn’t actually get the passwords themselves. To get the account passwords they would have to decrypt the information first, something many hacker’s don’t bother with. If you or your company has a Twitter account, you would have already have received an email if your account was breached. While 250,000 sounds like a high number, keep in mind that there are over 72 million active accounts (users who post more than once a week). While this is a drop in the proverbial bucket, it’s still a security threat that you should act upon. At the very least you should take steps to change your password. You can do this by logging into Twitter and pressing the cog in the top right of the tool bar. Select Settings followed by Password. Enter your current password, followed by a new password and verify it. Press Save changes and you are done. It is a good idea to pick a completely new password, one with numbers, letters and if possible special characters like !, $ or ^. At the very least, it should be different from any other passwords you use. Looking to learn more about the security breach or if Twitter is right for your business? Give us a shout, we’d be happy to talk social media with you.